Do athletes deserve high rates of pay? 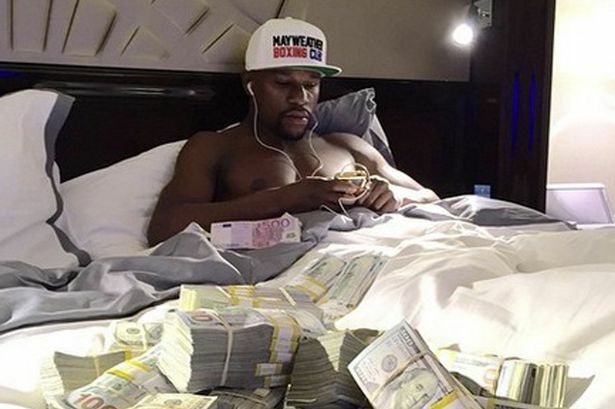 This year, according to Forbes list of highest paid athletes, Floyd Mayweather’s earnings from both his salary and sponsors will be $300 million. Messi will earn $73.8 million, Federer $67 million, Hamilton $39 million and Bolt $21 million. All of these men are unbelievable athletes who put in, and have put in, hours of hard work and dedication to become some of the best in their respective sports, but do they really deserve or need that much money for what they’ve achieved? If we compare Mayweather’s salary, $285 million, to the salary of an average London tube driver, $76,000, or to an average NHS doctor, $107,075, or to an average police officer in the UK, $40,502, then we definitely see a massive inequality. But these statistics aren’t the whole story, considering Mayweather is not an ‘average’ boxer, he’s regarded as the best – hence the pay, so comparing him to the ‘average’ of other jobs seems unfair. If we instead compare him to the best/most highly paid of the same three jobs; $92,673, $156,696 and $83,210 respectively, then we get a more fair perspective on the salary differences. Per year, for beating someone up in a ring, which he barely does anyway with such a defensive game, and for all his training and hard work, Mayweather’s salary is 1,819 times that of the most highly paid doctors in the UK. Returning to the average salaries for a moment, the average weekly pay in the Premier League is £25,000 per week, which means the average salary is around £1,050,000 when you take the length of the league and off season pay into account. A highly paid NHS doctor earns £69,325 per year – less than the footballer makes in 3 weeks. Let’s assume pay is based on how hard people work; Mayweather is renowned for being an unbelievably hard worker – commentators on boxing suggest it is this factor which has kept him at the top for so long. According to his training, he trains between 8-10 hours a day on the weeks leading up to a fight, slightly less when just training normally, but it must be said the actual training he does looks disgustingly difficult for the mere mortal – he definitely works incredibly hard. Similarly, the average GP will work a 9-10 hour working day, however the work does not appear quite as physically strenuous as Floyd’s training. From this it might be plausible to argue that an athlete may deserve a high rate of pay because of how hard they have to work to be in their positions. If we follow this line of debate however and presume that athletes have exceptional workloads, the argument fails when you compare athletes’ pay to each other’s. Both Serena Williams and Novak Djokovic are number 1 for women’s and men’s tennis, yet Djokovic brings in $48.2 million a year while Williams only gets $24.6 million. Both players have a large point margin over second place, and it’s safe to assume that they have similar training regimes being tennis players, and yet Djokovic earns more than $20 million more – how is this fair? Similarly, as Djokovic is number 1 in tennis we can compare him to the number 1 in a different sport such as athletics; Bolt, despite a horrendously tough training regime, earns a measly $21 million – all of that money comes from sponsorships as his salary is absolute $0, whereas Djokovic’s salary comes to $17.2 million. As someone who has done sprinting training at a BUCS level, and loves playing tennis too, I can honestly tell you that athletics training is brutal on the body. So if we’re suggesting that they deserve their pay because of how hard they work, there needs to be a severe overhaul of which sports get the highest pay. We can’t even remedy this issue based on how good they are at their jobs – if people are paid fairly based on how good they are at their individual jobs, then the top in every sport should be paid similarly, as should the average, as should those in non-sport jobs. If we instead base the pay on how important they are for society as a whole, the debate becomes a little more heated and convoluted. It can be argued that professional sport has a positive impact on society; sportspeople, who aren’t getting in trouble all the time, can be regarded as good role models; sports events are good for local economies, pubs putting on matches for example, as well as for simply giving people something to look forward to and to socialise around; they provide a window in which we can define morals and ethics to all of society, bettering issues of racism, sexism, homophobia and the likes. It would be foolish to argue that professional sports are completely useless to society. However, doctors save lives on a daily basis, rubbish collectors ensure we have clean streets – if they go on strike at any point then we’ll all be screwed, police ensure we have a society in which we can feel safe, even politicians do important work for society sometimes. It might also be foolish then to suggest that professional sports are 1,819 times more important for society than those who make society work outside of sports, and allow for a society in which professional sports can exist. If this article was written in a country like Brazil, the salaries of important figures that make society work would be vastly lower, and the issue would be far greater. Athletes are exceptional in their respective sports, and if we as a society regard sports as being worth paying for, then they deserve pay. However, personally, I can’t see any reason why some athletes will earn more from sponsorships and endorsements, like appearing in a few Gillette adverts on TV, in one year than the majority of people will earn in their lifetime – similarly with their salaries, the average footballer in the Premier League has worked hard to be in their position, but £25,000 per week hard..? That’s far more debatable.